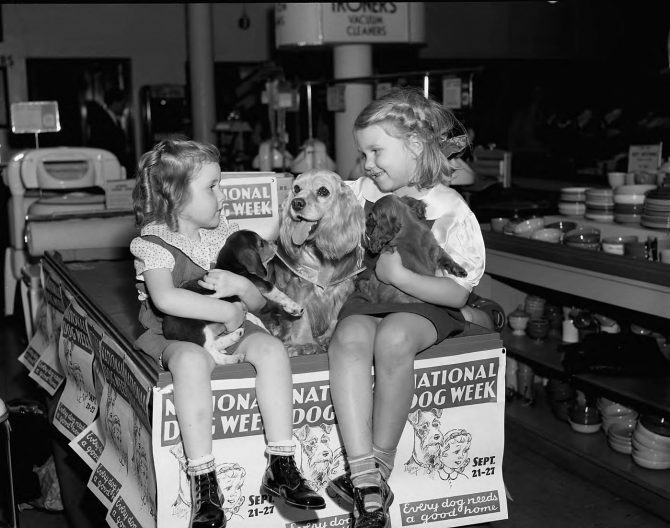 On September 24, 1941, two unidentified young girls were photographed with three dogs at the Sears Roebuck store, 1148 Broadway, to help promote National Dog Week. The girl at the left held a beagle pup; the one at the right, a cocker spaniel. Between them, sitting on the counter, was a grown cocker spaniel. National Dog Week was founded in 1928 by Captain Will Judy, a noted judge and former publisher of Dog World Magazine, to promote dog ownership and better dog care.